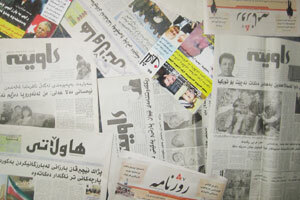 Iraq under my skin: Give journalists their information! Working as a journalist in Iraq is not at all simple. Getting information from government officials is often difficult. To shoot pictures or video outside is often stopped by police or army. Government departments and ministries hardly have spokespersons, or PR sections that understand the needs of the media. For this reason, many reports in the Iraqi media have an anonymous source. Nobody in the government is allowed to talk to media but the highest responsibles, and they often do not want to.That civilians have a right to information, and that the press is the in between in this sense, is either not known or seen as undesirable. So journalists get their information from anonymous sources in the government. This makes the journalistic rule that one source is no source a hard one to abide by. The search for a second dependable source is a hard one, if the authorities do not want to comment or speak on the record. The Culture and Media Committee in the Iraqi Parliament understands the problem, and has demanded that government ministries must be more transparent and provide information to the media, instead of promoting the activities of officials. The committee has sent official letters to all the media offices in the ministries, in which 'the necessity of adopting new media rhetoric' by providing information that media outlets request has been stressed, AKNews reports from the mouth of committee member Ali al-Shallah. Currently, about twelve Iraqi ministries do not have spokespersons. Amongst them are the ministries of Foreign Affairs, Trade, Industry, Interior and National Security. The Ministers often do only speak to media of their own party, or to foreign media. Iraqi media from other parties or independent Iraqi media thus can only use those media as their source, or resort to an anonymous source. It was saddening to see the reaction of the Foreign Ministry after AK News reported that the Sudanese President Omar al-Bashir could be arrested by the international police of if he attends the Arab summit in Baghdad on March 29. The Ministry accused the agency of 'fabricating [the] issue'. The statement from the ministry read: ,,We warn the agency of the consequences of continuing in this way, which is far from the honest Secretariat of press releases." Part of this problem can be solved when spokespersons are contracted and trained to work in a professional way. This does not solve the problem that anyone with a camera is seen as a danger by police and security police in Iraq. Photographers get into problems whenever they are caught working by these officials. They are demanded to remove the pictures taken, or - worse, even to hand over their memory card. In the past weeks I have been working with security police in Erbil and Sulaymaniya to talk about this problem - which is much smaller in Kurdistan than in Baghdad. Still, photographers will be stopped by police if they want to shoot a picture of a mosque at sunset. Some policemen are convinced this is how spies get their information, and how terrorists plan their attacks. It is hard to convince them that even a journalist is innocent until proven guilty. Media in Iraq still have a long road to go in becoming professional - and so do authorities and police. The positive thing is, that many people at the higher levels in the society realise this. Let's hope they will make sure the necessary change is made.